On December 18, 1767, an agent of England’s Wedgwood potteries finished extracting several tons of fine white clay from the mountains of North Carolina. By the 1740s, people in England and across the American colonies knew of the valuable white clay deposits in the Cherokee region of the North Carolina mountains. A British patent was filed around 1744 “for the production of porcelain from an earthy mixture, produced by the Cherokee Nation in America. 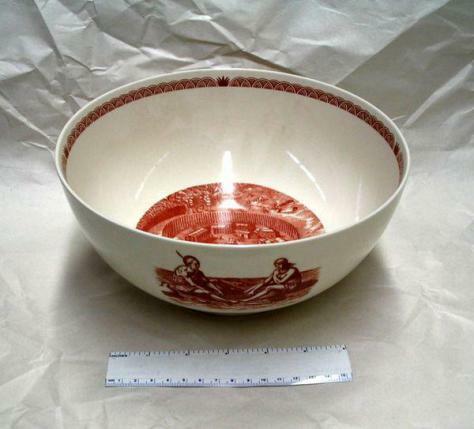 With increasing interest in creating porcelain in England and the colonies, Josiah Wedgwood launched efforts to secure what was called Cherokee Clay. He hired an agent, Thomas Griffiths, to travel to America to conduct the business. Griffiths went to the Indian settlement of Ayoree in what is now Macon County to negotiate an arrangement for the purchase of five to six tons of Cherokee Clay. The clay was carried down the mountains by pack horses. Griffiths delivered the Cherokee Clay to Josiah Wedgwood in April 1768. Because of the expenses incurred, Wedgwood never pursued additional shipments of the clay. His supply lasted 15 years. In 1783, he wrote that Cherokee Clay was the basis of his newly manufactured biscuit porcelain.